If the Congress wins in Telangana and even one of the two big Hindi states, the ‘mar’ of the Bimaru states, it will be a major blow to Mr Modi. 2019, like 2014, will be another presidential election year. Not since 1971, when the Congress Party fought with Indira Gandhi as its only face and only reason, will India see such a personality-focused election. Her campaign call then was “I say ‘Garibi Hatao’ and they only say Indira Hatao!” Narendra Modi now cannily implies just that. He says when he promises “development” his opponents’ only chant “Modi Hatao”. I can see this becoming the 2019 campaign theme “Modi kehta desh badao, aur wo sirf kahtein Modi hatao”. He will paint his opponents as a bunch of power hungry and out of work and corrupt politicians who have come together just to usurp the gaddi in New Delhi. He may be right. So far Mr Modi has not allowed them to define who he really is. Just as corrupt as them but determined to redefine India within the walls of Hindi, Hindu and Hindutva. This is the Hindi concocted by the East India Company; the Brahminical Hinduism that led to the crisis of character that allowed every other sundry adventurer carve out a realm; and the Hindutva defined by V.D. Savarkar — the three essentials of which are the three untruths of a common nation (rashtra), a common race and a common culture/civilisation (sanskriti). Clearly this election is not just about “development”. It is about the soul of India. At stake in 2019 is what kind of an India will we become? India was conceived by its founding fathers to be a state of many nations united by a shared vision and a Constitution that enshrined equality, liberty and justice to all. It envisaged a nation united by a shared vision of the future and not divided by the rancour of the past. The nationalist movement was not just a struggle to expel the English from India but a struggle to create a new and modern India, which will be a beacon of hope for a new world. It envisaged an India where egalitarian ideals mesh with unfettered individual freedoms that will catalyse a long dormant creativity into a nation that will fulfil most aspirations in some measure rather than for in excess just a few. It was an India that would internalise all its past history into one common and seamless narrative. In this conception the majestic Meenakshi temple of Madurai, the magical caves of Ajanta, the beauty of the Taj Mahal and the lost hopes of Fatehpur Sikri, and the imperial grandeur of Raisina Hill will all be seen by Indians as their common wealth and shared history. So far the Hindi, Hindu and Hindutva vision of India has been largely confined to the Hindi-speaking Indo-Gangetic plains, whose history too, if seen in isolation, has been quite different from the rest of the country. But they are our largest and most dominant minority. Their area ranges from Bihar to Rajasthan, from Haryana to Madhya Pradesh, and the two Devanagari states of Gujarat and Maharashtra. This is the heart, lungs and belly of India. These are the fields where the seeds of this “new” nationhood have been sown and for the past two decades have been reaped for political profit. But now the landlord is very different. It is no longer the avuncular political conservatism of Atal Behari Vajpayee and L.K. Advani, using the rightist nationalist fringe to be discarded after use. Now the lunatic fringe is astride the BJP. The 2018 elections in Rajasthan, Madhya Pradesh and Chhattisgarh, where the BJP has deep roots and enjoyed power, and where the usual anti-incumbency should be kicking in, has been diluted by Mr Modi’s unhistorical stridency. These states have traditionally had a bipolar polity divided between the BJP and the Congress. This latest contest has now been largely transformed into a contest between Narendra Modi and Rahul Gandhi. It is only in Rajasthan that the local Congress leadership of former chief minister Ashok Gehlot and Pradesh Congress Committee president Sachin Pilot has been seen as leading the charge against Vasundhara Raje’s personalised misrule and failure to provide for a state regularly ravaged by drought and stricken by backwardness. However in Madhya Pradesh, the warring leaders of the Congress in the state have not been able to cut a coherent image of them as being able to do better than Shivraj Singh Chouhan. Jyotiraditya Scindia and Kamal Nath have largely been confined within their regions and limitations. Digvijay Singh, hitherto the tallest Congress leader in the state, is nowhere to be seen in the heat and dust of campaigning. It can be said that the only thing working for the Congress in Madhya Pradesh is the anti-incumbency sentiments inevitable in a system that cannot please all. Chhattisgarh was created to be a state where the adivasis would have a voice in the government and benefit from the state’s largesse. This has not been so. Both the Congress and the BJP represent the same traditions of the ruthless exploitation of the natural resources of the adivasi homelands. The local differences are mostly about power and pelf. These three states account for 65 Lok Sabha seats. The Congress only holds seven seats in the three. The 58 seats the BJP holds here, along with the 72 it holds in Uttar Pradesh form the bedrock of its majority in Parliament. It is the pulverisation of the Congress in these four states that resulted in the national dominance of a party that enjoys only 31 per cent of the national popular vote. If the Congress does better by winning one of the two big states, it could be interpreted as a major blow to Mr Modi’s re-election prospects in 2019. On the other hand with the diminution of the BJP state satraps, Mr Modi might fully assert himself and enforce the Hindi, Hindu and Hindutva regimen of the BJP, with the cow and temple as its leitmotifs. Telangana is the gateway to the Deccan. The new state witnesses another largely bipolar elections, between the charisma of K. Chandrashekar Rao and his reckless populism, and the faceless leaders of the Congress, now increasingly seen as marching behind Telugu Desam Party supremo N. Chandrababu Naidu. Ironically, Mr Naidu is the leader of the junior party in the Congress-dominated alliance called the Mahakutami. Till a few days ago it seemed that anti-incumbency buttressed by unhappiness over the unabashed one-family rule by the Kalvakuntla family was going to drown the Telangana Rashtra Samithi. 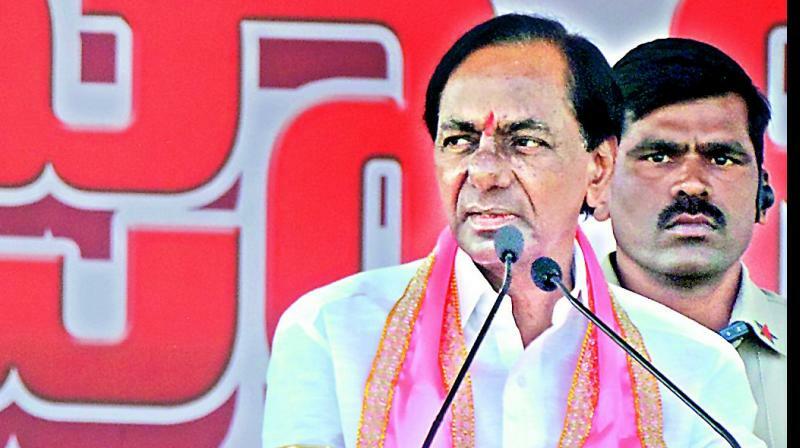 But KCR, the astute politician he is, helped by the somewhat lacklustre and maladroit Congress state leadership, has turned it into a KCR versus NCN, and hence once again a TRS versus TDP contest. One should not be surprised if the TRS turns the table on the Congress and proves the opinion polls wrong. The implications of this are interesting and fraught with possibilities. By winning Telangana, the TRS will strike a major blow to any claims Mr Gandhi might have to being the tallest Opposition leader in the country. KCR will also ensure that no major political alternative to Mr Modi’s narrow and virulent nationalism emerges with the Congress as its main phalanx. As somebody famously said — “all politics is local”. The TDP can afford to ally with the Congress because in Andhra Pradesh, the Congress is just an appendage to it, and not a rival. KCR might then once again make an effort to forge a non-Congress national alternative to the BJP. If the Congress wins in Telangana and even one of the two big Hindi states, the “mar” of the Bimaru states, it will be a major blow to the leadership of Mr Modi. Telangana will help the Congress line up the two non-Congress states in the south, with a major base in the north. By all accounts the Congress will fare considerably better in the Hindi states in 2019 than it did in 2014. In UP, the BJP won 42.3 per cent in 2014, but it slid down to 39.6 per cent in 2017. In both states the two other main contenders, the Bahujan Samaj Party and Samajwadi Party together polled more than the BJP, with 44 per cent each time. Now they are together. The BJP, electrified by Mr Modi’s incendiary leadership, won 72 of the 75 UP Lok Sabha seats in 2014. What will be the attrition when the BSP and the SP combine against it? I think there will be attrition in the Hindi belt. If it is substantial, we might see the return of the avuncular political conservatism of the Vajpayee years with a new BJP leader. If it is total, Mr Modi and Amit Shah will be subject to many trials.